I know this can be found elsewhere, but I thought it would be beneficial to have one thread of nothing but everyone's formulas for natural feed. I just spent two hours scrolling though various threads... And although it seems like people have similar feed formulas, it would be nice to see it all together. I am going to attempt to get all my angoras on natural feed by summer thanks to everyone's information on here! Thanks! What is your ratio of ingredients for natural feeding? Do you measure by weight or volume? Include how much you feed and whether you feed hay, alfalfa, and/or pelleted/cubed alfalfa as well. Please make your formula in list form so that it is easy to read. 1. Alfalfa hay with some grass content: free choice. 2. Whole grain, usually wheat but sometimes barley: about 1/4-1/3 cup per rabbit per day. 3. As many fresh greens as the season permits. Spring to fall this is mainly weeds and tree cuttings as listed in the Safe Plants sticky. Late fall through the winter, smaller amounts of root vegetables, cabbage, vegetable trimmings, wheat grass and/or sprouts, dried greens from summer and a bit of BOSS now and again. 4. Trace mineral salt block: free choice. My Grain-Ola recipe is evolving. Last batch was more of a "cracker" since I used the dehydrator. This is more of a supplement, than an actual feed. I am trying to improve condition (flax seed, BOSS and rolled oats) during the cold weather, while preventing (avoiding) wool-block. Also, I have a health food store right down the street--access to odd ingredients, but pricey. 1 c. Flax seed soaked in 3 c. warm water. this makes the "sticky" aspect of the supplement. And probiotic powder--I use papaya and pineapple pectin. Here's where I ran into a hitch...It looked like the stuff would get stuck in the dryer racks, so I lined them with paper towel and tore a hole in the center for heated air to circulate through. Sadly, the crackers stuck to the paper towel. More roughage? The rabbits don't seem to mind--besides they ingest cardboard frequently, what's a little paper going to hurt? The rabbi love it and I feel better about them having extra warm inner fuel in this cold weather. Cut and gather ingredients with a pruning knife found lying around that nobody ever uses and an old bucket with a hole in it that isn't good for anything else. Remove any old fodder from the hutches, and then divide fresh ingredients evenly between rabbits, placing fodder on the cage floor at the front of the hutches away from their potty corners. Serve with a tiny handful of pellets in a dish on the side (until the pellets run out, anyway--might as well use them up, having bought them). Clean and refill or top off the water crocks as necessary. Repeat twice a day. The proof will be in the pudding, or not, when my doe kindles and we see how the bunnies do. I might try to work in a little bit of banana and/or coconut as an energy supplement at some point. Each hutch also has a couple of sticks for chew toys and a mineral salt rock. I'm working with a lot of unknowns since my circumstance is so different from what's covered in most of the literature and forum discussion (plants, climate, production goals), so we'll see how it works out! Last edited by ramblingrabbit on Tue Jan 22, 2013 6:13 pm, edited 2 times in total. 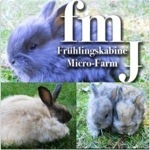 My buns get free choice grass hay year round as I've found this cuts down on a lot of issues. I also feed alfalfa cubes to up the protein and there is less waste with cubes vs hay. One day a week is a hay only day. The amount of grain I feed varies on season, they get a lot of green food in the summer and more grain in the winter. The amount varies based on the rabbits condition, age, weather and if they are cleaning up their rations. My grain feeding is a little unusual, I had a lot of issues with waste because the rabbits would eat what they liked and scratch through the mix. To solve this I started alternating grains, oats and barley. I often top dress the grain feed with some black oil sunflower seeds or flax. it means more tubs in the feed area but less grain going on the floor for the chickens to pick at. For example everyone got around half a cup of oats with a big pinch of boss on top for breakfast, at evening feed I will top off hay and everyone gets a couple alfalfa cubes. Tomorrow is a barley/flax day. All bunnies have mineral/salt licks. This is pretty much how I feed my rabbits, but I use wheat with just occasional supplements with other grains. I feed alfalfa hay rather than cubes because it is far cheaper here, just $3.25 a square bale - about 40 pounds. In summer they get more greens and less grain. They eat less hay in the summer too but it is always available. Trace mineral salt block is important. Dangerbunny, you will probably find some helpful hints in our ebooks. They are vintage and antique books that are in the public domain and can be distributed without copyright issues. Just about all of them predate commercial pelleted feed. Go to the menu bar at the top of the Index page and click on EBOOKS. You "pay" for them with the BunnyBucks you are accumulating with each post. This is very helpful, and thanks for the tip on the ebooks! -A mixture of cut forage, as much as they will eat, optimally about 1/4 grasses, 1/4 legume forage (like Cajanus cajan, cowpeas, or wild plants like Leucaena leucocephala, Chamaecrista nictitans, etc. ), with the remaining half consisting of a mixture of herbs, garden greens, sweetpotato leaves and vines, and other edible foliage. -A handful per adult rabbit of "energy foods," consisting of a mixture rolled oats, sunflower seeds, sliced root crops (carrots, sweetpotatoes, beets), and chopped sugarcane (unpeeled). We always feed the oats and sugarcane daily, but don't always have all of the other things. Pregnant does get extra oats and legume forage for extra energy and protein. Each hutch has a salt spool. The only feed ingredients purchased, incidentally, are the rolled oats and the salt, which is nice (an important goal for me from the beginning of the endeavor was to minimize off-farm inputs). I am curious to the rate of grow out for all natural feed. I currently feed pellets but do supplement with free choice hay and lots of herbs, weeds and garden greens. I would like top do more but I have time restraints and don't want my buns to suffer if I can't manage. I have also feed sprouted wheat tops. Does anyone do fodder? Thank you for all the formulas. They are definitely helpful to get one thinking about the possibilities. Small hobby farm raising Californian, American Chinchillas, and meat mutts. stone soup farm wrote: I am curious to the rate of grow out for all natural feed. I currently feed pellets but do supplement with free choice hay and lots of herbs, weeds and garden greens. I would like top do more but I have time restraints and don't want my buns to suffer if I can't manage. Grow out will be slower on all-natural foods. My rabbits take about 14-16 weeks instead of 10-12. But overall the cost, for me, is much less, since alfalfa hay here is only $3.50 a square bale. The meat tastes better on a pelletless diet. Regarding fodder, there is a multi-page thread about it here in the Natural Feeding forum. My last litter they were about 4 pounds at 12 weeks, dressing out to just over 2 pounds. They are 3/4 NZ White and 1/4 Champagne, btw. This time I'd like to grow them out for at least a couple more weeks, like Maggie does, as they were still putting on weight pretty quickly at that point. Not bad, considering the only thing I bought was oats. (You can see what I feed now in my previous post). I bet the pelletless diet does taste better. Maybe I can try this on jus tone group of my rabbits so I can see the amount of time and the taste difference. I appreciate all the formulas and already have a lot of the grains around. Is the wheat feed whole or do you need to do something to it? I thought I have read that barely (which I also have a big bag of) need to be cracked for rabbits. Does anyone know? Stone Soup, wheat and barley can both be fed whole. Even oats can be fed whole, but because of the difference in the husks (not sure that is the right word) some rabbits prefer them cracked or rolled. MaggieJ wrote: Stone Soup, wheat and barley can both be fed whole. Even oats can be fed whole, but because of the difference in the husks (not sure that is the right word) some rabbits prefer them cracked or rolled. I think it is husk. I usually have rolled but looked at getting groats too. I am going to start my one buck on a grain mix diet with alfalfa/grass hay mix. He really doesn't like pellets and eats everything else as much as he can, so I think he is the perfect candidate. I am happy to not have to take the extra time to grinding or cracking grains. I will use rolled oats to start or maybe steel cut.